Everyone knows (or they should, by now) that you need an antivirus package on your desktop or laptop computer. There’s a lot of different kinds of nasty malware Viruses, Spyware, Malware, etc. Explained: Understanding Online Threats Viruses, Spyware, Malware, etc. Explained: Understanding Online Threats When you start to think about all the things that could go wrong when browsing the Internet, the web starts to look like a pretty scary place. Read More out there, and you need to be protected. But what about your smartphone or tablet? Does your Android phone need an antivirus? What about your iPad? Your BlackBerry or Windows Phone? The answer is actually a bit complicated. The short answer is that yes, you probably need some sort of security app on your smartphone or tablet, because there are security vulnerabilities 3 Smartphone Security Flaws That You Should Be Aware Of 3 Smartphone Security Flaws That You Should Be Aware Of Read More in these devices. But how likely you are to be faced with malware and what your options are for protection depend greatly on your device. Because Android app stores, including Google’s own store, have a tendency to be pretty lax when it comes to screening apps, they regularly let in quite a few apps that contain Android-specific malware Malware on Android: The 5 Types You Really Need to Know About Malware on Android: The 5 Types You Really Need to Know About Malware can affect mobile as well as desktop devices. But don't be afraid: a bit of knowledge and the right precautions can protect you from threats like ransomware and sextortion scams. Read More . Ransomware is an especially insidious threat that’s been popping up more over the past few years (the FBI ransomware FBI Ransomware Hits Android: How to Avoid Getting It (And Remove It) FBI Ransomware Hits Android: How to Avoid Getting It (And Remove It) Learn how to keep your Android device safe from FBI Ransomware with these tips. Read More is a good example), and protecting your phone against it could save you a lot of trouble if you accidentally download a malicious app. 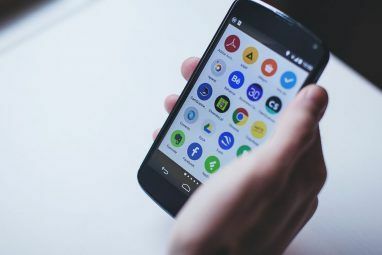 Android has a near-monopoly on mobile malware threats, with some reports showing over 95% of mobile malware targeting this operating system. Fortunately, here are a number of high-quality Android antivirus and antimalware apps available, and choosing one really comes down to which interface you find easiest to use. The latest (at the time of this writing) AV-Test.org tests gave top marks to Alibaba Mobile Security, AVL by Antiy, Baidu, BitDefender, BullGuard, ESET, G Data Kaspersky Lab, Qihoo 360, and Sophos antivirus apps. To get these high marks, the apps had to pass detection tests on over 3,000 pieces of real-world malware, have a minimal effect on battery life and performance, and not trigger false alarms. A number of these apps also include other features, like ESET’s Security Audit and Qihoo 360’s Privacy Protection. You can also install apps that provide a firewall for your Android phone, like DroidWall, though most of these require that you root your device The Complete Guide to Rooting Your Android Phone or Tablet The Complete Guide to Rooting Your Android Phone or Tablet So, you want to root your Android device? Here's everything you need to know. Read More , potentially exposing it to further danger. Adding a firewall does give you another layer of protection, but because of the ways in which Android phones are usually attacked, a firewall isn’t totally necessary. Guarding yourself from malvertising What Is Malvertising and How Can You Prevent It? What Is Malvertising and How Can You Prevent It? Malvertising is on the rise! Learn more about what is it, why it's dangerous, and how can you stay safe from this online threat. Read More is another important step in protecting your Android phone. Because malvertising has only recently become a major threat, there are fewer options for protection. Disconnect, a great privacy extension for your browser, offers an anti-malvertising solution called Disconnect Malvertising that you can download for your Android device as well. And using the Adblock Browser, powered by AdBlock Plus, will stop ads from loading in the first place. You hear people say on a regular basis that you don’t need antivirus software on OS X or iOS, because iOS is basically a scaled-down version of the Mac operating system. You do need antivirus software on your Mac 9 Apple Mac Antivirus Options You Should Consider Today 9 Apple Mac Antivirus Options You Should Consider Today By now, you should know that Macs need antivirus software, but which one should you choose? These nine security suites will help you stay free of viruses, trojans, and all other sorts of malware. Read More , though . . . so do you need it on your iPhone or iPad, too? The antivirus/antimalware situation on iOS is quite a bit different from that on Android. Apple keeps a much closer eye on its App Store than Google and other Android app providers do on theirs (the “walled garden” approach), which means you’re less likely to download malware from the App Store. For this reason, Apple doesn’t even allow true antivirus apps into the App Store — they’re just not needed (at least according to Apple). Apple also created iOS from the ground up to be very secure Smartphone Security: Can iPhones Get Malware? Smartphone Security: Can iPhones Get Malware? Malware affecting "thousands" of iPhones can steal App Store credentials, but the majority of iOS users are perfectly safe – so what's the deal with iOS and rogue software? Read More , so full-system scanning apps aren’t allowed in the App Store. The security apps that you find only have limited scanning ability—often for email attachments or single files, for example. This makes them rather ineffective as antivirus apps, but because of the low chances that you’ll actually need one, that’s not a problem. 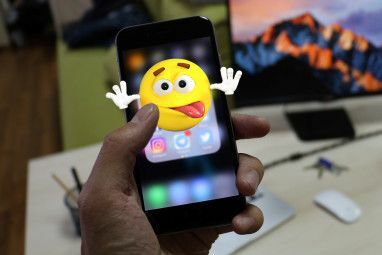 If you jailbreak your iPhone Jailbreaking & iOS: The Pros and Cons of Voiding Your Warranty Jailbreaking & iOS: The Pros and Cons of Voiding Your Warranty Have you been feeling the need to jailbreak recently? With the latest tools, freeing your iPhone, iPod Touch or iPad (not iPad 2) is as easy and accessible as it’s likely to get. There are... Read More to download non-App-Store-approved apps, that’s another story. 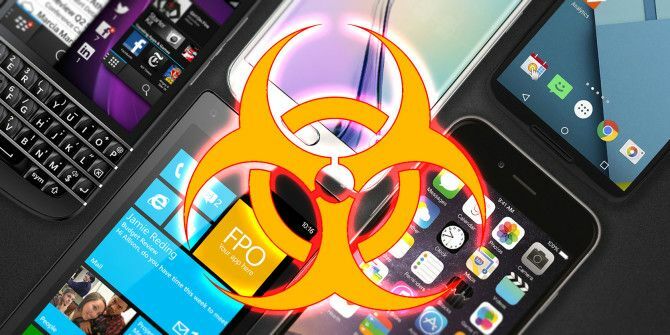 If you’re getting apps from other repositories, there’s a good chance that you could download something nasty, and there’s a precedent for it — quite a few people have dealt with iOS malware on their jailbroken devices. If you’re looking for a good jailbreak antivirus solution, you’re on your own — independent antivirus testers don’t run tests, and because the big names in antivirus don’t offer full antivirus apps for iOS, it’s tough to know which to trust. Malvertising is still a potential attack vector, though. Disconnect Malvertising is also available for iOS, and the Adblock Browser will help keep you safe from malvertising, too. If you use these two apps, you should be pretty safe from most of the threats out there for iOS, unless you jailbreak your device, in which case all bets are off. Like Android, BlackBerry doesn’t take the “walled garden” approach to their apps that Apple does, so some nefarious apps do slip into the app store from time to time (interestingly, however, one of the recent pieces of malware that hit a lot of BlackBerry users also affected iOS devices). The number of people using the BlackBerry mobile OS is significantly smaller Are Blackberry and Windows Phone Users Discriminated Against? (No.) 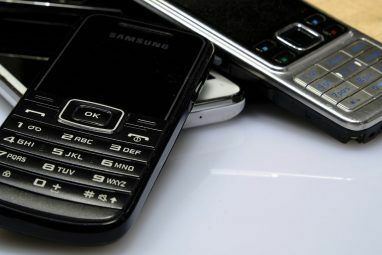 Are Blackberry and Windows Phone Users Discriminated Against? (No.) Blackberry CEO John Chen says "providers must be prohibited from discriminating based on the customer’s mobile operating system." That's nonsense. Read More than those on Android or iOS, so it’s less profitable for hackers to target BlackBerries . . . even so, running an antivirus app on your phone is a good idea. Again, because this isn’t as big of an issue as Android malware, the big independent testers don’t run tests on BlackBerry antivirus apps. However, both Kaspersky and BullGuard offer apps for BlackBerry, so you do have options. I’m not aware of any browser-ad-blocking apps for BlackBerry, though there is an app called Ad Blocker for BlackBerry that blocks ads within apps. If you know of an adblocking solution, please share it in the comments! Windows 10 Mobile doesn’t have nearly as big a user base MakeUseOf Says Goodbye To Windows Phone MakeUseOf Says Goodbye To Windows Phone This is going to be a tearful goodbye, buddy, but it has to happen. MakeUseOf will soon be parting ways with Windows Phone. Read More as Android or iOS, so it’s targeted quite a bit less. In fact, in 2013 and 2014, there were reports that Windows was the least-targeted mobile operating system. However, the new Windows 10 Mobile operating system is being touted as a scaled-down version of desktop Windows, meaning that it’s quite possible that standard desktop malware could be pushed to mobile Windows platforms. If you’re still on the Windows 8 Phone operating system, getting an antivirus app from a brand like Kaspersky or Norton is a good idea, especially if you’re getting apps from third-party app stores. Because we don’t have much information about Windows 10 Mobile yet, it’s too early to say what your options will be or how likely you are to need them. Stay tuned! Do You Use Antivirus Apps on Your Smartphone or Tablet? Your risk of downloading malware depends very much on the mobile platform that you use, as do your options for preventing it. No matter which smartphone or tablet you have, though, it’s probably a good idea to run at least some protection. Do you already use a security app? If not, will you download one after reading this article? Let us know which platform you’re on and whether you’ll be protecting yourself from malware in the comments below! Explore more about: Antivirus, Malware, Ransomware, Smartphone Security. Here in the USA I use Lookout anti-virus and My Backup to back up to local SD card. I have not seen any problems, but that may be because I am slightly paranoid about my digital operations. This stuff happens to me and my husband all the time! Its really creepy. Today I was watching hgtv on the island house and then a couple hours later went on instagram and an add popped up of the specific island house that was on TV!!! I never looked ANYTHING up. Another day we went to a kids birthday party and it was 'Trolls' theme and we had no clue what it even was cause we had never seen the movie..... later on our computer we started getting 'trolls' adds and toys pop-ups. This happens almost daily with us. Yesterday I realised how blatantly I was being recorded. I'm a teacher and I was at my student's house while it occurred. During our lesson he was confused about the Medieval Period so I asked him to google it to make the lesson more interesting. I had my android smartphone on the desk the whole time. Later that day on You Tube a video on Medieval History came up in the suggestions. That's weird! Had you used your phone to do any research for the lesson? On for this when we give apps permissions and certainly when we sign on for Google services. Pretty creepy isn't it. We need to pay attention to what we click and accept and we need to make more people aware an then we can all demand much more transparency. Even if the motives aren't Malicious they are far over Reaching. In my opinion we as a society such care more! , before there is nothing to care for. I have been buying goods on aliexpress for about a year now. I change my phone and getting access to it is giving me headache. Please help me out. I have items awaiting payments but can't access them on this phone . I'd recommend signing in from a computer. That's probably your best bet. Wow, that chart from av-test.org looks way different from the one I just viewed tonight. Mine has Avast on there, Peter Colpaert, albeit thirteenth on the list. I wonder what's up with that? Why the disparity between these two lists? I think I'll try some of the ones higher up the list, because even though I'm using Avast as I have for a few years now, I don't care for the new interface and the fact that they dropped the firewall function ticks me off. Does anyone know a quick and easy chart somewhere that lists features in each app (like firewall)? BTW, I sorted the list for "protection", just as you did, Dann. Oh...great, informative article! Yeah, those charts can change pretty fast, and the platform that you look at can make a big difference, too. I'm not sure why there are such disparities, but I've noticed it in the past. I'm not sure of anywhere that provides a quick feature list for antivirus apps; that would be really great! If I find anything, I'll be sure to report back. If you regularly pirate software or movies, download apps from sites you've never heard of, click on links from people you've never heard of, and are awaiting your money from a Nigerian prince, you need an antivirus program. Otherwise, probably not. And remember that "free" programs, other than free and open source software (FOSS), all have a way to make money off you. They may push ads or, more troubling, they may sell data about you (and an antivirus program has access to everything you do). If you're talking about desktop Windows, you DEFINITELY need antivirus/antimalware, whether you go to "shady" sites or not. The majority of threats aren't from "shady" websites, they're from sites running WordPress, Drupal, or any number of "CMS" sites; from "worms" and hackers looking into your computer even if you never run a web browser at all, looking for cracks in the computer's security; and looking for people who are only running Windows Defender, which even Microsoft has said is "just enough security to download an antivirus and install it." If you decide to not run an antivirus "because I don't do anything risky"...you're part of the problem; eventually, your computer will be part of the botnets that send spam and perform DDOS attacks on demand. I don't know a whole lot about desktop Windows, but the fact that so many OSes are going multi-platform could be a big boon for malware developers. If you can use the same piece of software to infect a computer and a phone, you're going to see a lot more opportunities across a wide variety of OSes and platforms. And you're totally right—there are a lot of threats from sites that don't seem like they're risky. The new "multi-platform" malware (that uses Java to infect *any* device, be it Windows, Mac, Linux, iOS or Android) may just be a proof-of-concept right now, but it's the "wave of the future" - malware developers will be able to infect anything they want. Anti-virus and anti-malware isn't just optional any more - you either protect your device, or you're part of the problem: you're going to be infected and turned into a "bot" spreading even more infections around. If you tell yourself "I'm careful, I don't need antivirus," you're just fooling yourself. Yeah, the multi-platform stuff is kinda' scary. It hasn't started really kicking in yet, but I'm sure it will soon. I totally agree that not protecting your device is asking for trouble. Whether you're visiting questionable sites or not, it's just not a good idea to go unprotected. I think it's more than downloading apps from sites you've never heard of—it's downloading apps from anywhere other than a regulated app store. Even in those stores, there's a minor risk of getting a malware app. No, it's not common, but it does happen. And if you've rooted your device and are looking around the internet for things you can download, there is a risk. It might be small, but it's there, and it's worth protecting yourself against. The only time I've encountered malware on an Android device was from a teenager who had willfully loaded a hacked copy of a game that had the fee for microtransactions removed.. He got it from a torrent site, not even an app store. Another part of this narrative is that most Android users don't install all that many apps in the first place. It's actually even somewhat common to talk to users who aren't aware that they CAN install apps. Even fewer know how to get apps from anything other than their device's official app store. I'd say 99% of the ones who do wouldn't be bothered to do it. The only people who really get hosed by that are the ones for whom the official device app store is neither Google nor Amazon, as is the case with some cheap knock-off tablets that just have an unlicensed AOSP build on them rather than fully functional Android. Do I think running security software on Android is a waste of CPU cycles and battery life? Do I think this is fear mongering that isn't justified for 99% of Android users? I do. Smartphone malware is about as big an issue for most Android users as the Zika virus is for a geriatric Canadian couple. Fear mongering for 99% of Android users? I'd say that's quite an exaggeration, but I understand your point. No, it's not for everyone. It's not for the people who don't know that they can install apps on their phones. And it's not for those who know what an unlicensed AOSP build is. It's for a small group of people in the middle, who have an idea of what it's possible to do with their Android phones, but don't know the risks that are involved. For those people, I would recommend security software. If you're thinking about AV using up CPU cycles and how pirated games that don't have microtransactions can be torrented, but not safely, this article isn't really for you. But there certainly are a lot of people out there who could, in fact, benefit from this information. Either you forgot Avast! on the Android overview, or it is so bad that it isn't included. Hoping for the former, as I'm a happy user of Avast! since years, both on my Windows PC and on my Android devices. Avast! wasn't listed on the comparison that I checked, so I left it out. I'm not sure why it wasn't on that list, though—I was curious about that myself. It seems to be a pretty good AV package, and a legitimate defense, so I'm not really sure what's going on there. If I find anything out, though, I'll be sure to let you know! Avast is an excellent antivirus for Android and Windows. In fact, the Android app has more features than many of the paid apps. I haven't checked any of the reviews lately, but they generally do very well. The Windows version is usually very good too and I recommend it to people who just won't pay for protection. It's definately better than Windows Defender. Thanks for the tip! Glad to hear that it works well for you.